Click on Buy Links for more product info. "This brass incense burner with star cut-outs can either be hung or carried by its 16" chain to spread relaxing aromas throughout your home. 3" diameter x 6" high. " "Shesham wood incense burner with floral cut-out design and brass inlay running along the sides. 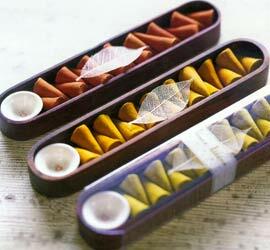 A side compartment stores extra incense sticks. 11 1/2" x 2" x 2 1/4" high. " "A Shesham wood incense burner features a brass celestial inlay. The top lifts to store incense when not in use. 14" x 1 1/2" x 2 1/2" high. " Place incense on the skull-shaped dish that fits inside this alabastrite Merlin to cast a spell for exotic scent. With holes in his mouth, back, and shoulder, he'll be enshrouded in aromatic smoke. 5 3/4" x 5 3/4" x 10 3/4" high. Incense not included. "Cast in antique-finish aluminum this unusual incense holder bears the images of both Kuan Yin Goddess of Mercy and of a fierce dragon. 1 3/8" x 10" x 1 1/4" high. Sold as package of six. Price per package of six." "This "fiery" dragon breathes only the soothing vapors of incense. 14" x 3 1/2" x 3 1/2" high. " 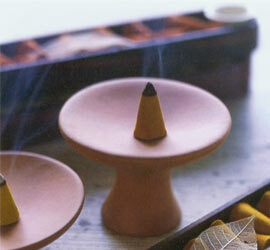 This Terracotta Incense Holder is perfect to burn individual incense cones or even candles. 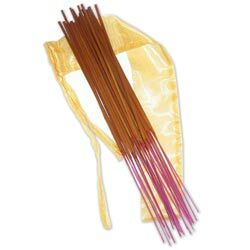 A must accessory for any incense lover. Incense cones sold separately. 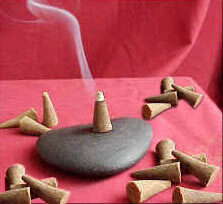 The manufacturing of herbal incense is nothing less than a sacred art. Employed to counteract disagreeable odors and drive away negative energies incense is said to both manifest the presence of the gods and to gratify them. 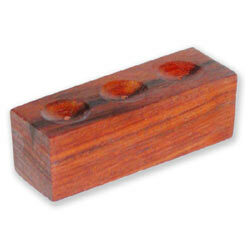 This Rectangular 3-Holed Wooden Incense Holder is perfect for our incense cones or sticks. The manufacturing of herbal incense is nothing less than a sacred art. Employed to counteract disagreeable odors and drive away negative energies incense is said to both manifest the presence of the gods and to gratify them. 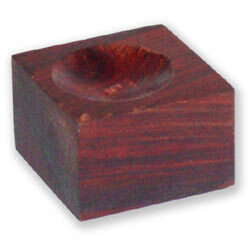 This Square Wooden Incense Holder is perfect for our incense cones or sticks. Think safety. Fragrance your home office or dorm with wax potpourri without an open flame. 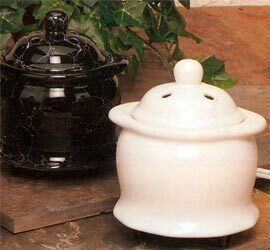 Whether you call it an electric tart burner an electric tart warmer an electric simmer pot an electric diffuser or an electric potpourri pot this is a must candle accessory. UL approved and available in black or white.